A young and sweet pit bull was found behind a warehouse in south Memphis with hundreds of bite marks and other severe injuries. Liam, as the rescuers named him, had been used as bait for dog fighting and his abusers are still at large. 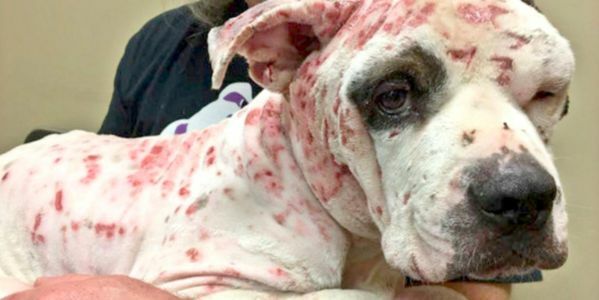 Sign the petition to demand Memphis authorities find the people responsible, charge them with animal cruelty, and prosecute them to the full extent of the law to ensure no other dogs suffer Liam's pain. Liam was found with hundreds of bites on his body. His left eye was swollen shut and his paws were so injured that he couldn't even walk on his own. Thank god he was rescued and survived, but he is in for a long recovery. But he has clearly lived his whole life being attacked again and again by other dogs. And once he was of no use to them, the abusers just left him to fend for himself. Pit bulls who are naturally sweet are often used as bait to train other dogs in dog fighting. The idea is to train the other dogs on how to attack dogs like Liam. It's called a bloodsport, and for good reason -- the losing dog dies and that's the end of the "fight." These dogs are often drugged with steroids and their tails are docked and ears cropped so that their normal body language cannot be read. They experience extreme abuse to bring out their aggression, and never experience the love every dog should. All this abuse happens just to entertain cruel and dangerously violent people. It's a disgusting "sport" that only attracts truly heartless people and deeply damages the dogs involved. It is a felony in every state, but it still goes on with abandon. That's why whenever there is a lead like a bait dog like Liam being found, authorities must take it extremely seriously! Please sign on to demand justice for sweet Liam and catch the dog fighting ring leaders in their heinous crime.